Parents : Sardar Ram Kishan Singh and Mata Harbans Kaur. Bhai Sahib had taken Amrit Straight After 10th class. Bhai Sahib and Bhai Balwinder Singh Jattana were stopped at a checkpoint of Saadhugarh. Bhai Balwinder Singh Jattana had a fake ID card under the name of Jasbir Singh, a CBI officer and Bhai Sahib was the driver. When Bhai Balwinder Singh Jattana showed his ID card, the police officers at the checkpoint saluted Bhai Jattana and Bhai Sahib drove off. 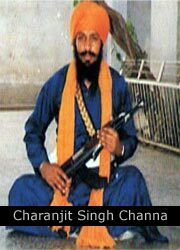 Bhai Charanjit Singh Channa was born on the 5th January 1964, in the house of Sardar Ram Kishan Singh and from the womb of Mata Harbans Kaur. Bhai Sahib had total of 8 brothers and sisters. Here their names in order, Bibi Rajwinder Kaur, Bibi Surinder Kaur, Bhai Davinder Singh, Bibi Mahinder Kaur, Bibi Ranjit Kaur, Bhai Darshan Singh, Bhai Charanjit Singh and Bhai Satpal Singh. Bhai Sahib studied up till 8th class at the local school in village Jhalan Khurd. Then Bhai Sahib passed his 10th class at a school in Ropar. In 1980, after passing 10th class, Bhai Sahib learnt electrical work. After learning, Bhai Sahib worked as an electrician for 3 years. Then Bhai Sahib started working at DCM Engineering Projects. While Bhai Sahib worked here, the Indian government attacked Sri Harimandir Sahib and killed thousands of innocent Sikhs. Bhai Sahib had taken Amrit Straight After 10th class. Surely after the attack on Sri Harimandir Sahib, Bhai Sahib as an Amritdhari Sikh youth would be affected. After killing many Sikhs, the Indian army started raiding villages of Punjab at night and arresting the Sikh youth. The army raided the village of Bhai Sahib and arrested him. After being handed over to the police, Bhai Sahib was charged with many fake cases and put in to jail. In 1986, Justice Ajit Singh Bains acquitted Bhai Sahib of all charges and Bhai Sahib was freed. After coming home from jail, Bhai Sahib started working at a sugar mill in Marinda, but the police did not stop harassing Bhai Sahib. If anything happened in Bhai Sahib’s village, the police would arrest him. A Thanedar named Kanss was known for bringing terror on to the families of innocent Sikhs, whenever Kanss wanted to arrest Bhai Sahib, he would go to the family house and arrest Bhai Sahib. At the police station, Kanss would drink alcohol and torture Bhai Sahib. One day when Kanss came to arrest Bhai Sahib at the family home, but Bhai Sahib had gone out. Kanss arrested Bhai Sahib’s mother and young brother, Bhai Satpal Singh, the 2 family members were taken to the police station and questioned, but the family did not know where Bhai Sahib was. Bhai Sahib had his mind up, on never to come into the hands of the police alive. Bhai Sahib’s actions were recorded, day by day the list of Bhai Sahib’s actions grew longer and longer. When the government of India tried to transfer the water of River Satluj outside Punjab, Bhai Sahib and Bhai Balwinder Singh Jattana killed the people in charge of this project in Chandigarh and till today this project has not been touched. The partnership of Bhai Sahib and Bhai Balwinder Singh Jattana was getting stronger day by day. The Sikh Freedom Movement took to new Heights in 1990. Bhai Sahib had gone to USA under a different name. It is said, that in the area of Bhai Balwinder Singh Jattana, a group of black cats under the command of Daljit Dalli started throwing dirt on to the names of Khadku Singh’s. After speaking to Bhai Balwinder Singh Jattana in July 1991, Bhai Sahib returned back to Punjab. These days, the butcher SSP Sumed Saini’s car had exploded with bombs in Chandigarh. Bhai Balwinder Singh Jattana’s name was mentioned in this action. The Indian government used its black cat Ajit Phoola under the appearance of a Nihang Singh. In between 21st – 30th August 1991, Ajit Phoola was seen asking for direction to the Jattana village. That very same night, the family of Bhai Balwinder Singh Jattana was killed. Bhai Sahib gave Bhai Balwinder Singh Jattana the courage to carry on. Bhai Balwinder Singh Jattana smiled at this cowardly act of the Indian government and said, “Well, I also will join the path of Guru Gobind Singh Ji”. 4th September 1991, the Babbar Khalsa held a meeting in Patiala, which both Singh’s attended. On the return from the meeting, due to informant giving information to the police, Bhai Sahib and Bhai Balwinder Singh Jattana were stopped at a checkpoint of Saadhugarh. Bhai Balwinder Singh Jattana had a fake ID card under the name of Jasbir Singh, a CBI officer and Bhai Sahib was the driver. When Bhai Balwinder Singh Jattana showed his ID card, the police officers at the checkpoint saluted Bhai Jattana and Bhai Sahib drove off. Daljit Dalli was behind Bhai Sahib’s car and when he reached the checkpoint he shouted at the officers, “Oi, your fathers have crossed the checkpoint. What are you doing standing here?” Upon hearing this, the police started chasing Bhai Sahib’s gypsy. Bhai Sahib started driving fast and on the turn near the village Saidpur, Bhai Sahib’s gypsy numbered, CHO1 8206 tilted over due to the speed. Bhai Sahib was badly wounded. After this Bhai Sahib told Bhai Balwinder Singh Jattana to get out of the area before the police comes, but Bhai Balwinder Singh Jattana did not agree. Then the 2 sons of Guru Gobind Singh Ji, maintained the strong friendship and took capsules of cyanide and attained shaheedi. As the news of Bhai Sahib and Bhai Balwinder Singh Jattana’s shaheedi spread in the Punjab, Sikhs and Hindus were saddened. Students Fathegarh Sahib College did a massive protest, which forced the police to hand over the shaheedi saroops over to the family. Both Singh’s were cremated and honoured by the Sikh nation.